A beautiful responsive website will help your business stand out from the crowd. Web design involves a range of disciplines including creating user experiences across such diverse platforms as laptops, tablets and smartphones. This is known as responsive web design simply because the design is adjusting and adapting, or responding, to the platform on which it’s being viewed. 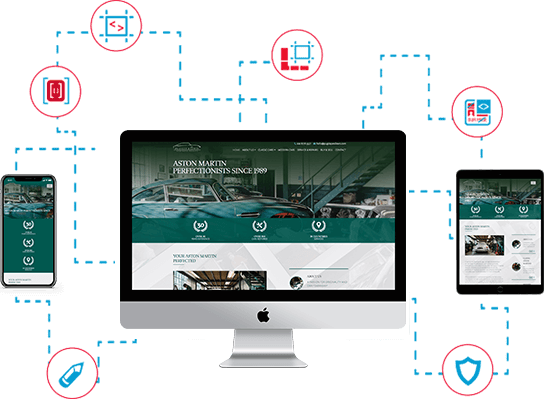 Complementing the design process web developers handle the technical aspects of producing a website including creating specific functionality, often involving interacting with databases. Most modern websites employ some sort of functionality created by a developer. Why Invest In Web Design? A well planned and well executed website can be a powerful business growth tool. With the right strategy, your website can attract and engage with new customers 24/7. The design alone won’t achieve this but once married with SEO, content marketing, social media and PPC the results can be spectacular. There are 100 billion searches per month carried out on Google alone. Making sure even a tiny percentage of these find out about your business can be extremely powerful. For that to happen you need a fantastic website. We’ve always taken a business-focused approach to web design. This means that along with creating websites that are aesthetically stunning, we’re hell-bent on making sure they get found in Google and deliver value to the businesses we build them for. We’ll challenge your current thinking about the web, show you how our methodology delivers value and create a website that makes a measurable financial contribution to your business.